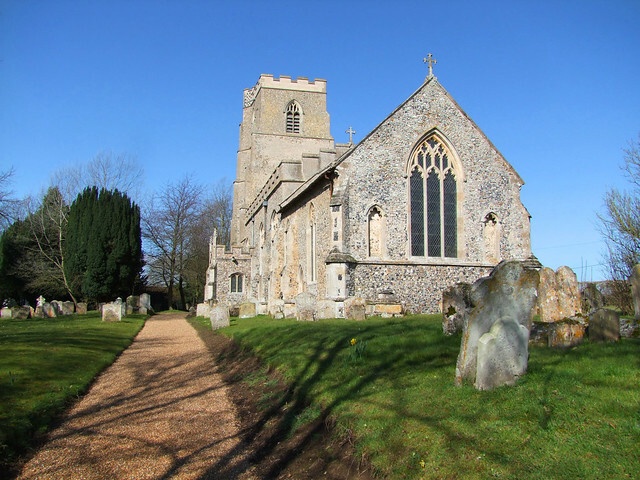 Stansfield was a place I sometimes recalled with affection - the church, for it was one of the first I'd visited when I started doing the Suffolk Churches Site back in the late 1990s. Like its neighbour Rede, I remembered it as an utterly ordinary little place, but open and welcoming, full of a sense of its own past, the recent and more distant. But it was easy for me to find other places to go, and I did not come back to Stansfield for nearly 15 years. In the gently rolling hills of south west Suffolk, tiny villages sleep the sleep of the quietly forgotten. How many people have even heard of Stansfield? Here, in this intensely agricultural corner, where the fold of a ploughed field can swallow a church tower, one might pass close by without ever knowing. So it was with a slight sense of guilt that I rolled up on a day of sub-zero temperatures in February 2013, flakes of snow combatting the north wind, only to find the church locked. I needn't have worried, however. For ordinarily this church is open every day, and coming back a few weeks later on a sunny April Saturday I found the big south door wedged open with a kneeler, to let in the air and the sunshine and me. Here, in the shadow of the glories of its famous other neighbour Denston, All Saints is a surprisingly large church. As you approach, the most striking survivals are a fine pair of decorated niches either side of the east window, as at Cotton, and a superb roodloft stair turret, rising above the roofline and surmounted by battlements, as at Clare. 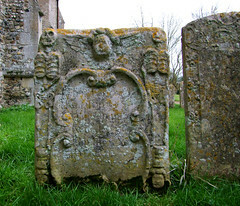 You can imagine a late medieval mason seeing the grand ones there and thinking hmm, I could do something like that. These survivals are signs that the Victorians were gentle with All Saints. The light Victorian restorations in this part of East Anglia are a reminder that this was a poor place then, which also explains Denston's survival. This is a church of the common people, where the plowman and the sheepboy came to worship. The poor font where they were baptised has been terribly chopped about, and it is hard to see exactly which century produced it - Mortlock thought the late 13th. It now stands rather awkwardly on High Victorian marble legs. The roof is late medieval, and is said to bear a carving on one spandrel of a scene from the legend of St George, although I am afraid that I could not make it out with my poor eyesight. An image niche containing a modern madonna marks the site of a chantry altar for the guild of St Mary. The piscina that served the altar can be seen beside it, beneath the window. Another madonna, in the form of a relief, leans in a window splay between the two war memorials. These are both to the First World War, which may seem surprising; but one remembers the Stansfield Congregational Sunday School boys who went off to die, and was brought here from elsewhere. The other is the parish memorial. Arthur Mee records the memory of Samuel Ogden, a Rector here in the 18th Century. He preached brilliant sermons in a growling voice, peppered with epigrams which were not understood by anyone in his congregation. It was not unknown for him to preach in Latin, or even Arabic. Mee claims that he was a popular man, and was admired by Dr Johnson. One wonders what the plowman and the sheepboy made of him.